Given by J W F Morton & Courtaulds Ltd. In the inter-war period Scandinavian artists were greatly admired for their high standard of design and especially for the production of woven patterns. Märta Måås Fjetterström occupies a central position in the history of Swedish textile design. 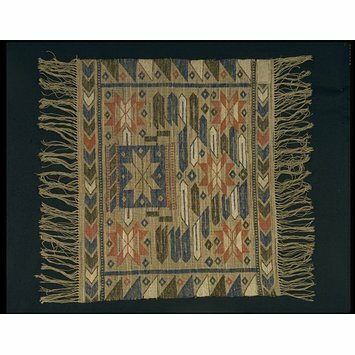 Although she trained as a painter, she gradually became totally absorbed in the folk weaving traditions of south-western Sweden and established a weaving studio at Båstad, which continues to produce her designs. Both the technique and the designs used at the studio are rooted in the local folk tradition: the eight-pointed star, diamonds and checks of this panel are all typical of the region. A panel of unbleached linen brocaded with coloured wools with a warp fringe. The predominant colours are red, white, blue and black. The design is not symmetrical. There are four red 8-pointed stars and the linen ground forms another 8-pointed star within a blue square. The rest of the field contain small dark diamonds and blue, black or white geometric motifs. The upper and lower borders contain arrow-like blocks in all the colours. The side borders contain inward facing right-angled triangles in blue, black and white with small diamonds in blue or red. 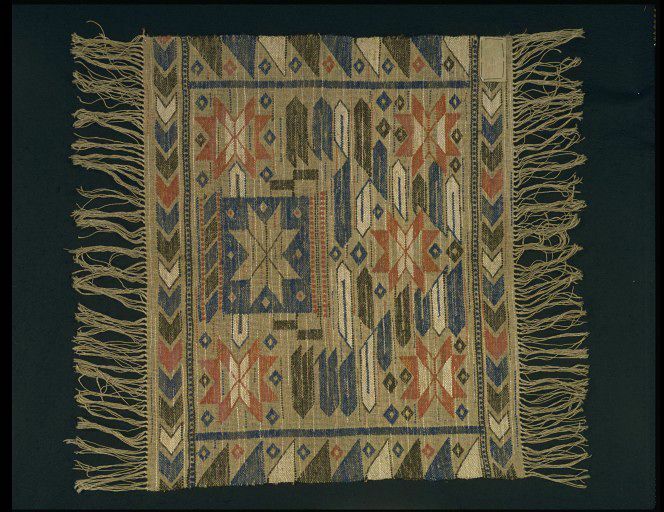 When displayed and illustrated the blue ground square has been in the upper part of the panel.This panel has been displayed by the V&A as a 'rug' - its precise function is not known and in all probability it was not intended to have only one function. Similar panel in the Nordiska Museet dated to the 1920s. 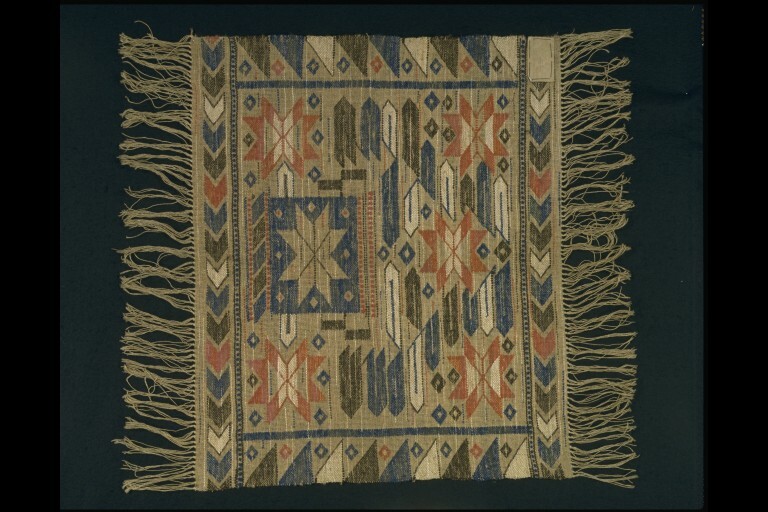 Panel of hand woven linen, jute and wool, Sweden, ca. 1930.